Beer was banned in Iceland from 1915 to 1989. Aside from bars and pubs where prices are high, the only place to buy alcohol is the government-owned Vínbúð stores. Whenever I visit a new place I make a point of seeking out beer from a local brewery if possible. 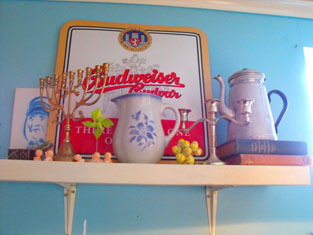 Not only because it's where it's likely to be at its freshest, but because beer drinking for me is all about context – that's kinda the point of this blog – and therefore drinking a beer in the place where it was brewed should result in some moment of epiphany where your surroundings and taste sensations align perfectly. However, the Reykjavík locals love their pale, low ABV lagers, and their breweries tend to supply this demand. Epiphany did not seem to be on the cards until I came across Ölvisholt Brugghús, a microbrewery on a dairy farm in southern Iceland. I knew it might be a struggle, but I had to do all I could to get my hands on this brewery's beer. 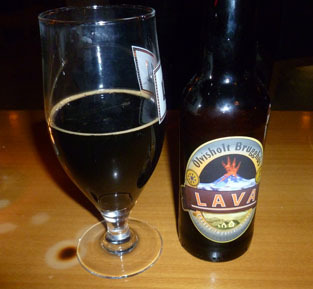 Lava is a smoked imperial stout and the beer I was most keen to try while in Reykjavík. I found it in the first bar I went to, on the first night of my stay. Smelling like a rauchbier and looking like a liquid version of the black volcanic rock that covers the island, Lava does not mess around. It's a deeply complex beer; 9.4% and tastes like it, but with a relatively thin, sticky body and – for a smoked imperial stout – a surprisingly crisp and clean finish. Móri, Ölvisholt Brugghús's red ale, is a treat. It's everything I want from a red ale: an almost Twiglet-like nose, malt that dominates without being overpowering, and a subtle hop bitterness in the finish that provides just the right balance. Billed as a ‘premium lager’, Skjálfti’s enticing amber colour and low carbonation makes it look more ale than lager, and the flavours support the visuals. Sweet malts are prominent here, eventually giving way to citrusy hop bitterness. Reminds me of Ballast Point’s wonderful Calico (but obviously not as good). I’m not a massive wheat beer aficionado – it's a glaring gap in my beer knowledge – but to me ‘wheat ale’ Freyja is bland and nondescript. Bit of fruit somewhere in there, but otherwise nothing to report. 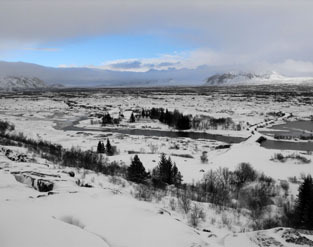 Iceland is like another planet. The volcanic rock, geothermal activity, giant glaciers, rift valleys, brutal snowstorms and -11°C temperature made it feel like I had been beamed down from the USS Enterprise to explore a hostile, but breathtakingly beautiful, new world. 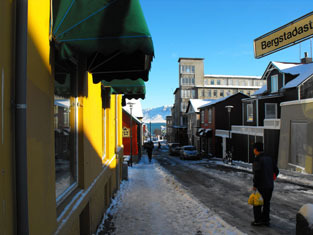 In the south west corner of the island, you'll find Reykjavík, the capital city. With around 120,000 inhabitants, it's small, impossibly cool and ultra laid-back. There's an abundance of characterful, inviting cafés, decorated like an eccentric grandmother's living room, that are perfect hangouts for when you need to escape the subzero temperatures (which is often). At night, many of them serve alcohol and they effectively become trendy bars. A boozy, smoked imperial stout, named after the substance that formed Iceland as it rose up out of the sea, drunk by a wood burning stove in a bar next to an ancient settlement in Reykjavík, promised to be the perfect beer and life match. And it was. As the snow came down outside the window, I sipped my Lava, and had one of those epiphanies I was talking about earlier: beer connects us with history, with the earth, with geology and geography; beer styles are even shaped by the weather. I knew these things before of course, but in that moment they had seldom been clearer or made more sense. 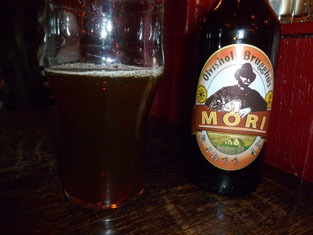 Móri, essentially a Scottish red ale, also made a lot of sense. I felt a real Scottish influence in Iceland, and it wasn't just because of the cold weather and availability of BBC Scotland on the telly – some of the residential areas of Iceland look strikingly similar to equivalent areas in the east end of Glasgow – only with less drunks being sick on themselves in the middle of the day. 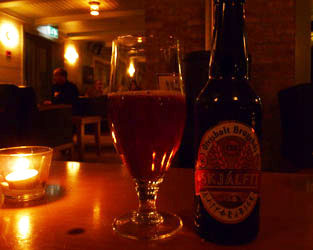 I did try other Icelandic beers while in Reykjavík, but none of them are worth mentioning here. 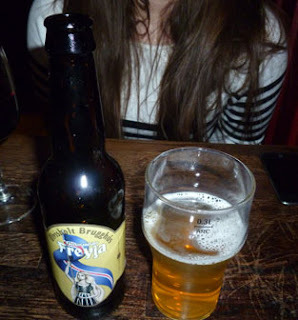 I even tried some beers from the Faeroe Islands, but the less said about them the better. Ölvisholt Brugghús beers were not available to buy in the government-owned stores I visited, so I wasn't able to bring any back with me. A pity, as Lava – with its unique combination of licorice sweetness, roasted malts and smoky meat flavours – is a truly distinctive beer that I am unlikely to be able to drink again any time soon.